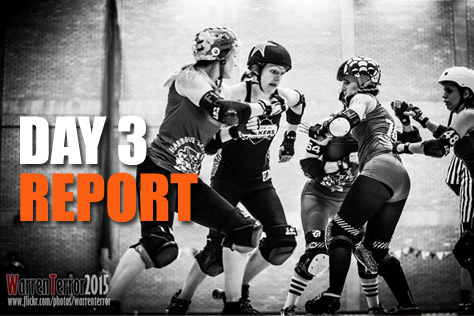 Portsmouth Roller Wenches are hosting the action in Havant. The mighty Brighton Rockers are sitting this one out (as are table toppers Royal Windsor) but Brighton will be hosting the final two divisional Game Days on 11th July and 9th August. They also have a taster session in Hove on Monday for those who want to give derby a try. As for tomorrow, even though the Rockers aren’t playing, pop along to Havant if you can. 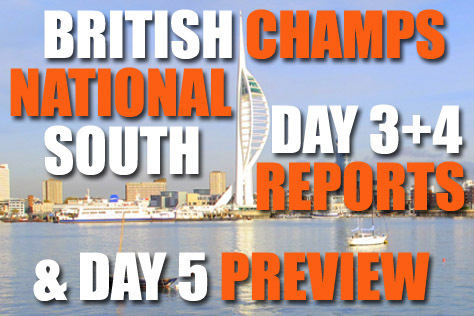 It’s only an hour away by train and the day’s opening game is a match-up between Brighton’s two remaining opponents. Doors are at 1pm with tickets available online (see link at bottom of this piece) priced just £7 for adults – far less than at any other National South Game Day – and free for Under 14s. Tickets will also be available on the door for an extra quid. Don’t expect much in the way of decent pubs in Havant – a Wetherspoons full of screaming kids is as good as it gets – although Portsmouth itself, or better still Southsea, is pretty good for ale. 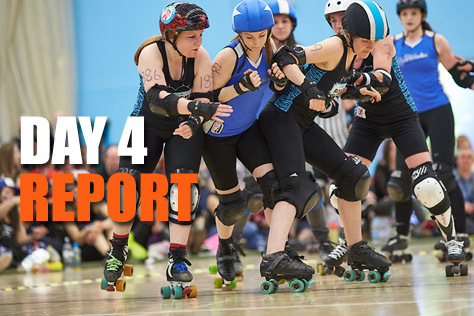 The opening game at 2pm features the Portsmouth Roller Wenches (who Brighton play in July) taking on Brighton’s Final Day opponents London Rockin’ Rollers. The Londoners sit in second place having won both their games to date, with Pompey fifth after two losses. LRR are ranked 14th in UKRDA on 625.3 points, whilst the Wenches sit in 20th on 592.5. Even given the Hampshire side’s home advantage, the predictor at Flattrackstats calls this as 70% chance of a London win, although the expected score differential is pretty close at 56:45. That works out at something like a 224-180 away victory, which is nail-biting in derby terms (although using the European ranking system the predicted gap is wider). 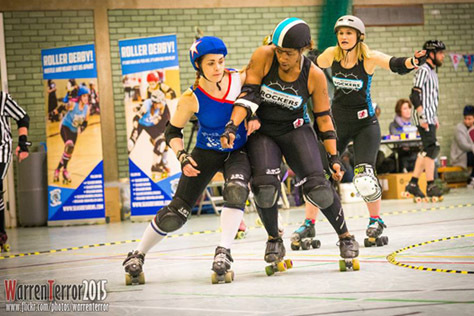 LRR have three jammers in the divisional Top Ten charts – Rammit, Beat Girl and Jack Attack – and nullifying these will be key to Portsmouth’s chances. Perhaps it’s such childhood dreams of crossing the Channel in record time that breeds hearty sporting stock like the Seaside Sirens. The local derbyers are swimming against the tide in this first match of Game Day Three, though. 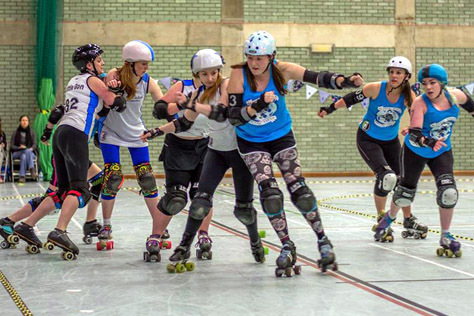 Opponents Royal Windsor are the National South division’s highest ranked side, and they know they have to beat the hosts by 160 or more points to retake top spot from the London Rockin’ Rollers. Windsor’s main tactic is a masterpiece of self confidence. Get lead, pass the Sirens pack, then call it right? Nah, not if you’re the Berkshire starhead you don’t. The jammers in white know how tough their own packs are; know that the likes of Trashbag, Laptalis and Riley Cyrus will hold the Southend jammers up for seconds that feel like minutes on every pass; know that if racking up as many points as possible is the aim, they might as well just let these jams run the full two minutes. Whilst the other side might make some passes, you – the Windsor starhead – will be making far more. The first jam runs the full 120 seconds. Windsor lead 22-12. This is about as good as it’s going to get for Sirens. Hosts calling an early team timeout now. Just three jams gone. Their Royal guests will dominate this game as they are dominating this division. 73-32 after eight minutes. Blue team battling. Ella Gnaw trading jammer-on-jammer hits with Cle-blam-O. Force Ten Gail probably the best option in the star for Southend, but the Windsor pack is castle strong and PoiSin Cherry is dancing in natural fives against her. Culverhouse starred up now and taking the outside line. Frocky Balboa and Tiny Temper amongst the blockers battling valiantly to hold back the Windsor wave. The hosts have named this event ‘Tsunami’ and the Sirens are getting swept away here by the sheer strength of the Royals. Ella and Tiny holding up Siouxsie Sutures well in the final jam, but when the whistle goes there’s 265 to 93 on the board. Windsor have passed the 160 point victory margin needed to take top spot… oh, and it’s still only half time. Refs share insights in the loos. (“There’s nothing to call; Laser’s on fire, he’s calling everything.” “The Windsor jammers are getting through without having to throw a hit.” “They aren’t going to let up in the second half, they want that differential.”) We do our usual thing of bemoaning the drink selection at the bar; 17 different sorts of lager but no actual beer, gah! Making the best of a bad situation, we decide to sample as many different lagers as possible in case we find one we like, and thus can recall very little of the second half, other than that it’s more of the same. The likes of Pegasus (who fouls out late on) and Gail work hard to eek out a few winning jams for Sirens, but the starheads in white – particularly Cleo, the standout jammer in the whole damn division – are too strong and the Royals take the win 508-141. Whilst the booze selection lacks variety – maybe it’s a local thing; even the Wetherspoons by Southend station had no dark beers – everything else about the hosting seems spot on. The bleachers are comfortable and buzzing (although the departure of much of the home support sees them thin out considerably for the second game) and the lighting is bright and white, rather than the yellowy murk favoured by many leisure centres. Most shocking of all, the first game didn’t start on time – which in itself is a real rarity in the world of UK derby – but five minutes early. Jeebers! The next game has been much hyped as a best of three decider, with Bristol and Brighton having previously met in 2013 (Bristol won) and 2014 (Brighton won). It certainly lives up to the billing. The Rockers get the best of the opening jams with single scoring passes to Emma The Condemner and Gin Atomic in the openers, before Swann, Hairy Fairy and Emma pin back Lil Miss Bloodlust for The Mighty Mighty Bash to jam in a hatful. In next to no time the Sussex league are 19-0 up. Bristol getting back into things now, though, with The Blizzard expertly marshalling Swann to kill off a Brighton power jam. Black Thorn sending Kapow to ground with a big hit as Til Thrillster takes advantage of Bristol’s first lead jammer status. Noise Tank is filling in for Mass Janeycide as bench coach and he calls a team timeout (Brighton now just 31-29 ahead) to halt the opposition’s building momentum. Raven Lunatic up against Bash in the star now, Bash off, Swann throwing shoulders at Raven to run down the jammer penalty clock, Bash on then off again, three penalties in a single jam as Noise screams from the sidelines. Lead change and the Westerners are starting to pull away now. 56-35 to Bristol. Their fans being typically noisy – the only really vocal support for any of today’s four teams. Two very tough packs out on track. The likes of Hairy, Bash and Dr Whooligan blocking well for Brighton; Raven, Thorn and Bazooka Salt likewise for Brizzle. Whooligan starred up now, shrugging off hits with great jamming to close the gap to 79-51. Delta Strike probably the most effective jammer in this game, drawing more penalties from Bash. Noise studying the penalty board during an official timeout. How many marks against 888 now? The Westerners holding a 108-79 lead at half time. Rockers claw it back to 102-112 as Delta serves time in the box, but a misconduct call on Whooligan sees Bristol regaining the initiative. Gin putting in some good jamming performances, but BRD are out muscling her at times. Bristol split the pack and lead by thirty with a quarter of the game left. Noise studying the penalty board again and conversing with Bash. Must be close to seven now. Hard-hitting Gin v Bloodlust jam goes 11-10 to the latter. Raft of penalties sees the Bristol blues down to one blocker on track. First foul out, but it’s Raven of BRD not Bash. Nine minutes left. Bristol player down injured. Team time out. 200-179. Ophelia Pain racking up a good haul as Brighton slip further behind. Whooligan star pass to Kapow. Rockers not going down without a fight. 220-200. Four seconds on the clock. Last jam. Gin gets lead. Vile Shadow down injured, half on track. Ref blows for safety. All the zeros on the period clock, but the jam didn’t end naturally, so reset to one second for an extra jam once Vile is happily up and off track. Whooligan lining up against Delta. Bristol jammer picks up a penalty. Swooping, skipping passes from Whooligan. Delta on then off again. It’s Whooligan v the jam clock now. Is there time? Must be close… The Bristol fans, pretty wild even at the quietest of times, go extra wild now, when – after a lengthy delay, with all the double checking of scores possible – the official result flashes up as 227-223. As with Southend, there is an efficiently on time start to proceedings in Bristol seven weeks later. So much so that as the first whistle goes we are still trying to find our way out of Bristol Parkway train station. As is usual with stations with the phrase ‘parkway’ in their title, pedestrians are barely even an afterthought. The lack of any sort of subway under the track means what should be a five minute hike to the University actually takes three times that. By the time we arrive at the sports hall the hosts have built up a decent lead over Portsmouth Roller Wenches. 65-38 says the board as Valkyrie Pain tussles with Bristol’s ex-Croydon starhead President Garfield. Crowd favourites Delta Strike v RIP McMurphy up next to jam. Things getting very physical in the packs as Nina Nunchucks and Lil Miss Bloodlust trade blows. There something disconcerting about today’s track and it takes us a few jams to fully work out what that is. In order to fit in extra seating – unlike BRD’s other venue nearby, they can’t use bleachers here – the track is at roughly a 35 degree angle to the hall itself. Whilst this does mean they can fit in a horseshoe of seating around 80% of the circuit, it also creates an optical illusion depending on where you are stood/sat. From where we are the track looks circular rather than an elongated oval. Luckily those taking part aren’t confused by the angled track the way we are, and the noisy Bristol support cheer on Delta as the hometown heroes pull ahead of the hundred point mark. Wenches star pass to Awesome Wells and there’s 124-67 on the board. Raven Lunatic and E-Z Roller pushing hard against Nunchucks now as Bloodlust spins in a series of scoring passes. Duchess of Crutches running strong passive offence for the Portsmouth jammer. It’s a strong end to the first period for both sides with 157-98 showing on the scoreboard. General consensus from the Bristol fans at half-time is that the impressive Bloodlust is growing stronger as a jammer with every outing “but she still looks like she wants to cry all the time”. It’s not often we encounter a sports centre with its own off licence, but any initial excitement at this revelation is tempered by two sobering facts. Firstly, you’re not allowed to drink in the hall itself, but must sit/stand outside like some kind of freak (ie smoker). Secondly, the only booze on offer is sickly sweet ciders and three different types of tequila flavoured lager. This is Bristol ffs, one of the best craft ale towns on the planet (as last night’s sojourn on King Street taught us) and this is the selection the denizens of this campus put up with? Students, it seems, have a lot to learn. In the interests of journalism we try all three of the tequila lagers and the second half is already underway by the time we make it back to the hall. RIP McMurphy off for a jammer penalty (not the rarest of events) and a star pass to Black Thorn sees the home captain speeding through the pack, with hard hitting from Vile Shadow clearing her a path. Halfway through the period and the hosts are 246-179 up. Official review for Portsmouth gives the chanting home fans an opportunity to remind everyone that “we like shouting”. Wenches battling back well now, clearing the 200 mark with the gap down to around fifty points. Penalty call on Psyclone Destroyer puts the toe-stoppers on the fightback as Delta power jams in a whole bunch. RIP closes out the game with a pass, call and fall. 305-253 final. Bristol are up to third, but there’s a humungous score differential separating them from second place LRR. PRW still to record a win, but they are playing less early games (only two over the first four Game Days) than most others. The Rockers are holding a team talk out in front of the offie. Noise Tank bench coaching again – presumably he’ll be taking on this role for away games now, with Janeycide helming the home ones. Not sure what Noise is saying to the troops – we’re distracted by more four-packs of horrible tequila lager – but they must know today’s game is going to be a tough ask. 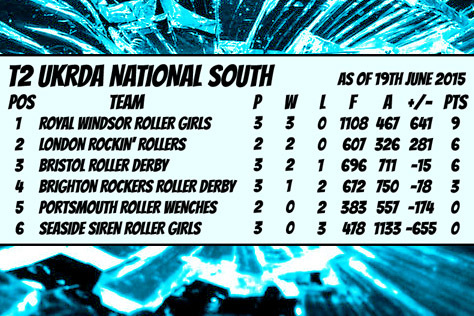 Royal Windsor Roller Girls are firmly ensconced at the top of the National South table, and by the time today’s final whistle blows they’ll have five jammers in the divisional Top Ten for points difference, plus *eight* players in the equivalent table for blockers. That should give you some idea how things are going to go here. Indeed, Windsor replicate the tactics from all their previous Champs outings. They’re happy to let the clock run down on most jams as they know their blockers will restrict the opposition to a limited number of scoring passes. First jam sees Gin Atomic pick up a penalty. Although she scores a few on her return, Cle-blam-O has put Windsor 27-11 up after one jam. Plus ça change. In fact Gin will spend the following two jams in the star as well, starting both in the penalty box as RWRG rack in another fifteen. 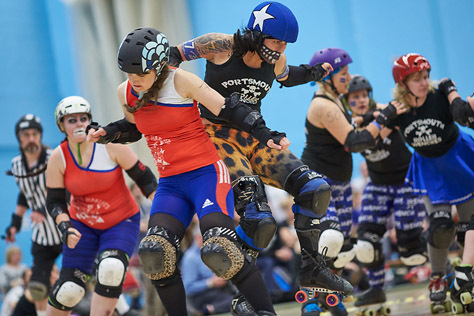 The Mighty Mighty Bash and Dr Whooligan pull a few back for Brighton, but the almost superhuman Cleo puts in a 20 point jam, sending Rockers jammer Hairy Fairy to ground when the latter tries to nudge her off. Noise calls an official review halfway through the half, but the 75-36 scoreline stands so he sits down and has a banana. Emma The Condemner steers Cleo off well now, but Gin picks up a track cut and is at some risk of fouling out before the interval. Lots of passive offence from Windsor, who seem to have a surprisingly small travelling support given their stature as a league. Maybe living so near to Legoland makes it hard to drag yourself away. What RWRG may lack in fan numbers they make up for in everything else, although Cleo will start the next one in the box after the refs confer. Whooligan taking full advantage of the PJ start with some great jumps inside turns one and three as Cake Or Death runs effective interference. The fast emerging Irish Mist knocks Siouxsie Sutures out well as Swann takes lead. Tough defence from Bash, Cake and others in the Rockers packs, but they’re picking up a lot of blocker penalties now. Round of applause for Laptalis as she takes out Bash. The period clock hits zero as a braced three-wall keeps Gin contained. The second half offers much of the same with Windsor swiftly opening up a three figure margin. 183-81 is 233-109 ten minutes later. 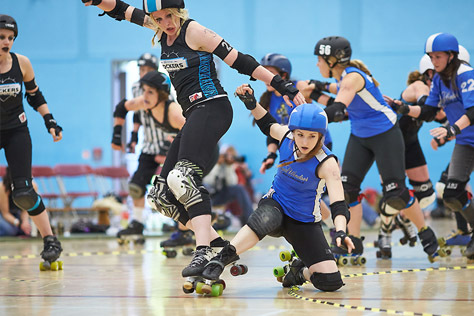 There’s some great springing down the inside line from Rockers debutant Skate Bush, who hasn’t looked out of place in Brighton’s jammer rotation against this storied opposition. The Rockers are matching Windsor point for point now, but that scoreline gap of 120-odd isn’t going anywhere. Team timeout to Windsor with four minutes left on the clock. Brighton picking up successive leads through Emma and Swann, but they’re 325-189 down now with a minute left. Whooligan v Sutures. The Royals jammer calls it with one second left as bench coach Rollin Stone R shouts for a timeout. Forcing the extra jam. They want more points. Greedy gits. They get them as a penalty call on Bash sees PoiSin Cherry win the final exchange 18-3 for an overall final of 348-196. As emphatic as that mighty seem, Brighton have picked up 56.3% of RWRG’s points haul here, which is actually better than anyone else has yet managed against Windsor in Champs – although we suspect LRR will have a damn good assault on that come July 11th. For now, we deport to No 51, a bar in the hipster heartland of Stokes Croft, where we order a multitude of Jägers to take away the taste of all that tequila lager. As things stand, going into tomorrow’s games in Havant, LRR will need to beat hosts Portsmouth by at least 360 points to retake top spot from the commanding Windsor crew. That looks very unlikely on paper, but any sort of London win will set things up nicely for the Windsor v LRR game in Haywards Heath in July – the match that could very well decide the title. From a Rockers perspective, final league placing is probably going to depend as much on Bristol’s results as their own. Portsmouth still have three games to play so absolutely shouldn’t be discounted (and could throw the centre table wide open with a win over LRR), whilst the Sirens will be hungry to try and eek out a win from somewhere before the season comes to a close. All the excitement. You’ll find ticket links to all three remaining National South Game Days below. Yay!